Bureaucrat is a very unique bookstore as it not only sells books but also has a cafe, restaurant, and gallery. 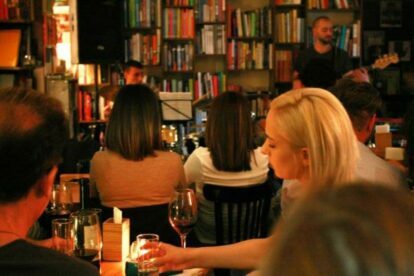 Here you can enjoy good wines, good coffee and good books. They also organize concerts of local and international artists, family events, exhibitions and etc. Information about events is available on their Facebook page. The staff is very friendly and speaks good english, so they can be very helpful to visitors. They have a very good collection of Armenian, Russian and English books, photo collections and many other books on topics of all tastes. The books are not expensive and are of good quality. I really enjoy having my hot cup of coffee sitting in the middle of this book world and watching through the huge glass doors. I even used to take my laptop and doing some work while sitting there. Overall, it’s a good place to relax and meet good people!